Sundays are fried chicken night at JuneBaby. 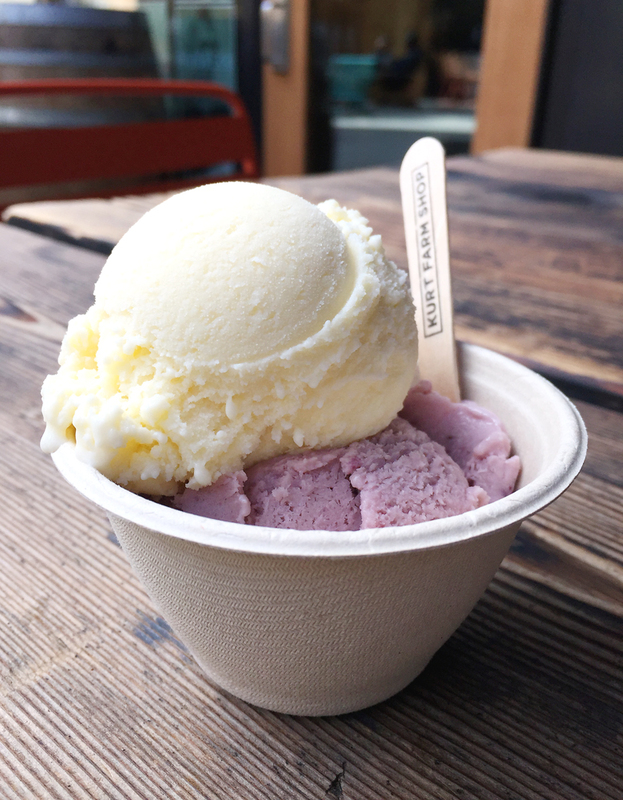 SEATTLE, WA — It was named the “Best New Restaurant” of 2018 by the James Beard Awards. 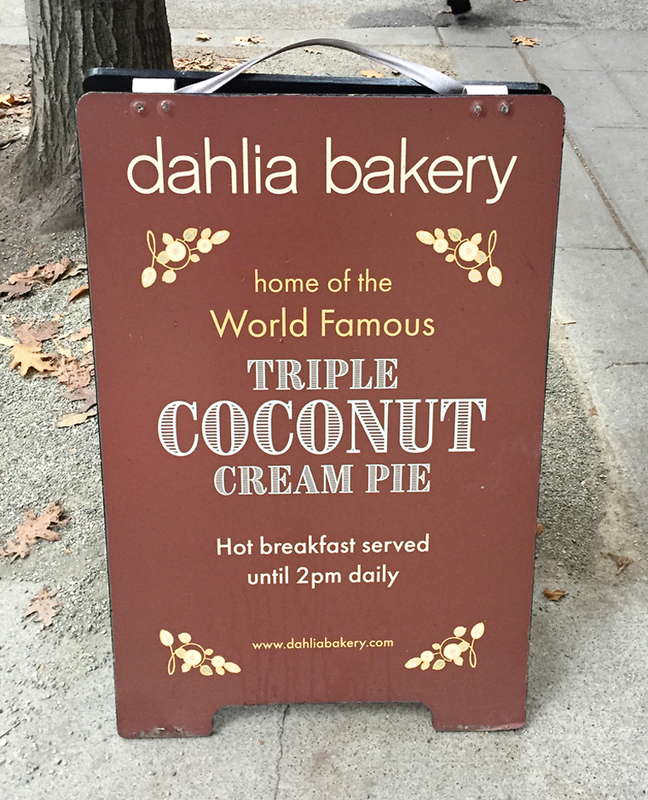 It is owned by the “Best Chef Northwest” of 2018, as bestowed by the same. And it is worth every single accolade. JuneBaby is even worth waiting in line for 90 minutes to snag two seats at the crowded, shoulder-to-shoulder bar, as I managed to do a week ago, paying my own tab at the end. Chef Edouardo Jordan is the first African-American to win that coveted national title. A Florida native, Jordan has some serious cooking chops, having spent time at the French Laundry in Yountville, the Herbfarm in Washington state, and Per Se and Lincoln, both in New York. He opened Salare, just a block away from JuneBaby, in 2015, which also won acclaim for its globally-inspired fare inspired by all the places he’s worked and lived. 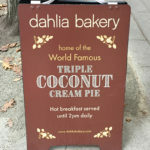 Winner of two James Beard Awards. JuneBaby, which opened in 2017, is his love note to Southern cooking, particularly the dishes his mother made him while he was growing up. 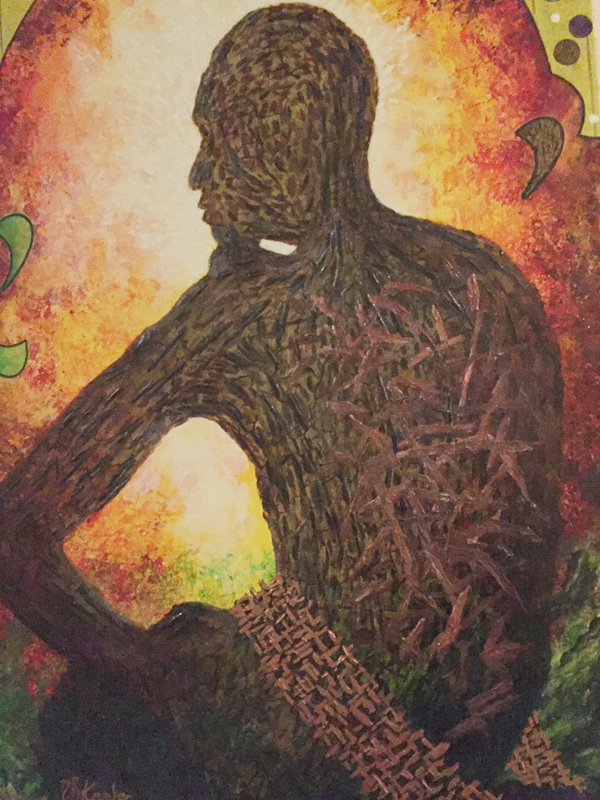 He uses local ingredients, including many heirloom ones, to execute soulful, rustic fare with refined technique. The portions are generous, and the prices relatively moderate for all that you get. The restaurant opens at 5 p.m., but it was already packed a little after 4 p.m. So just be prepared to wait, especially on Sundays, when the nightly special is fried chicken, which most people were ordering the Sunday we were there. 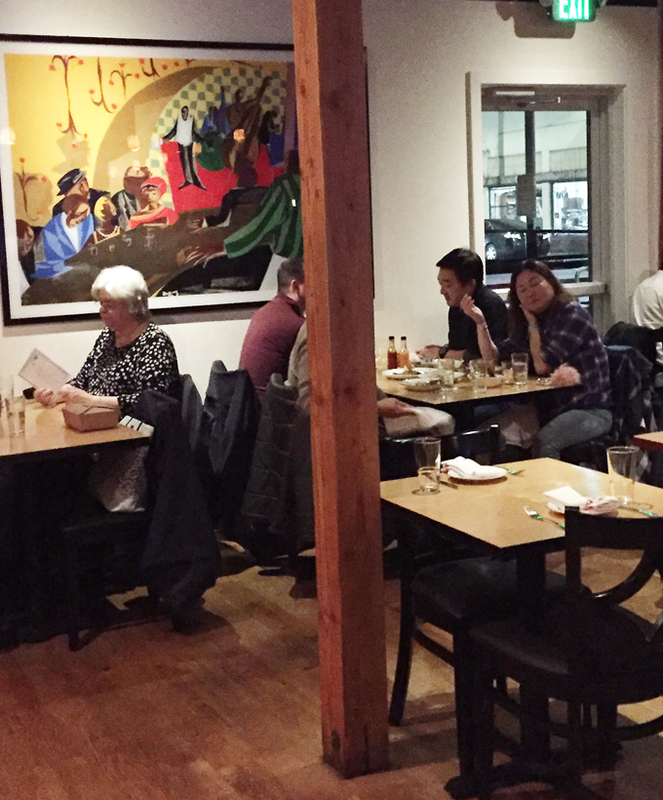 The dining room is small, but warm, welcoming and comfortable. 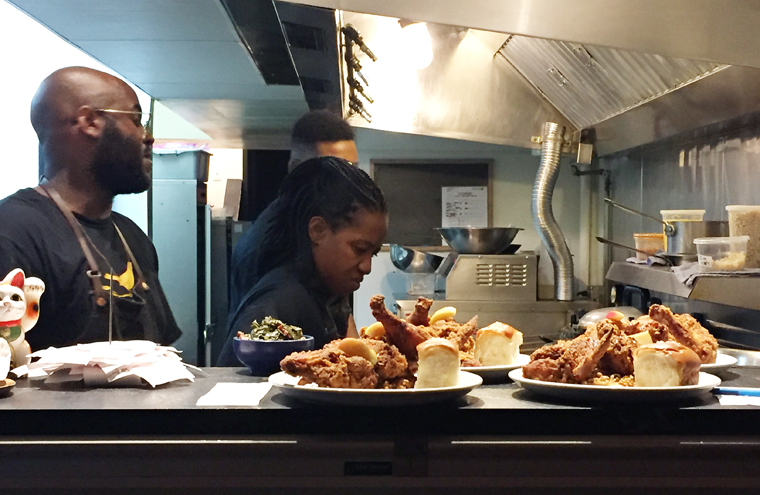 A peek into the kitchen with orders and orders of fried chicken. When you walk inside, the small restaurant is humming with conversation and loaded plates being ferried to tables. 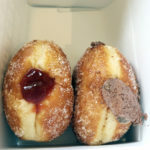 You get a sense that the staff is genuinely proud of the food by the way they talk about it. My new gold standard for biscuits. Let’s start with the biscuits. We must. I would return to JuneBaby just for these alone. They are impossibly tall, crisp on the top, bottom and all around the sides, with layers, layers and layers. They are incredibly buttery and flaky, nearly like laminated pastry. You get two warm ones ($5) with a saucer of pure cane syrup to spread on for just a touch of sweetness. I cannot say enough about these. Nor can I get them out of my head. Marvelous cornbread with a touch of sweetness. 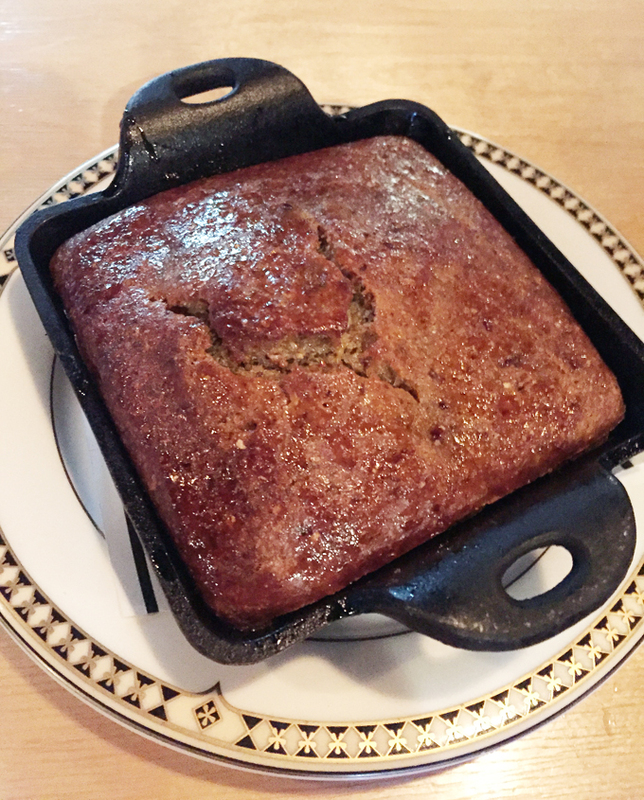 The cornbread ($10) arrives in a hot cast iron pan. It’s made with flint corn, so you really taste the corn flavor. It also has a rougher texture, showcasing the grain, unlike so many cornbreads that are as smooth and fluffy as cake. This one is very moist, and sweetened with sorghum molasses. It tastes like the South on a sultry day. 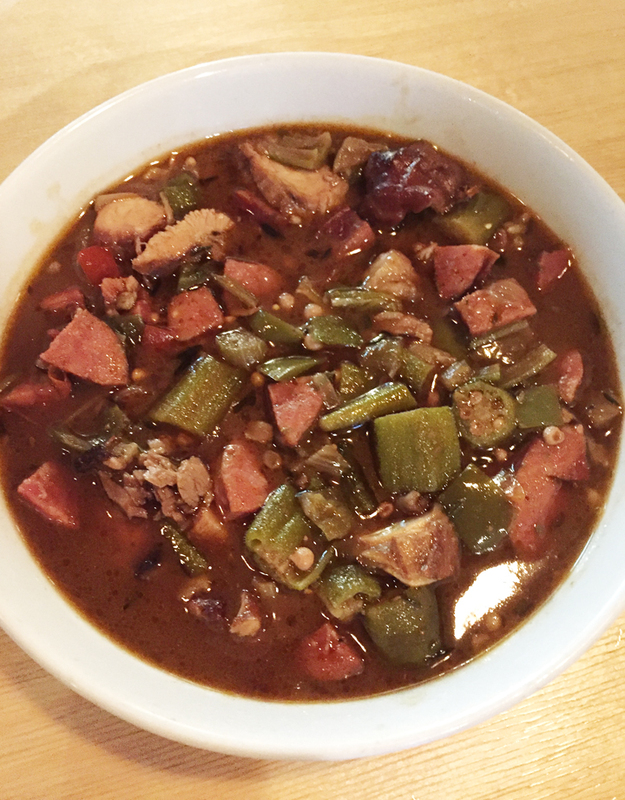 The gumbo ($14) changes up regularly. That night, it was a deeply flavorful mix of catfish, smoked turkey, andouille, hot link and brisket. It’s thick with okra, dark from its roux, and so satisfying on a drizzly night, of which Seattle has all too many. Deep, dark and delicious gumbo. 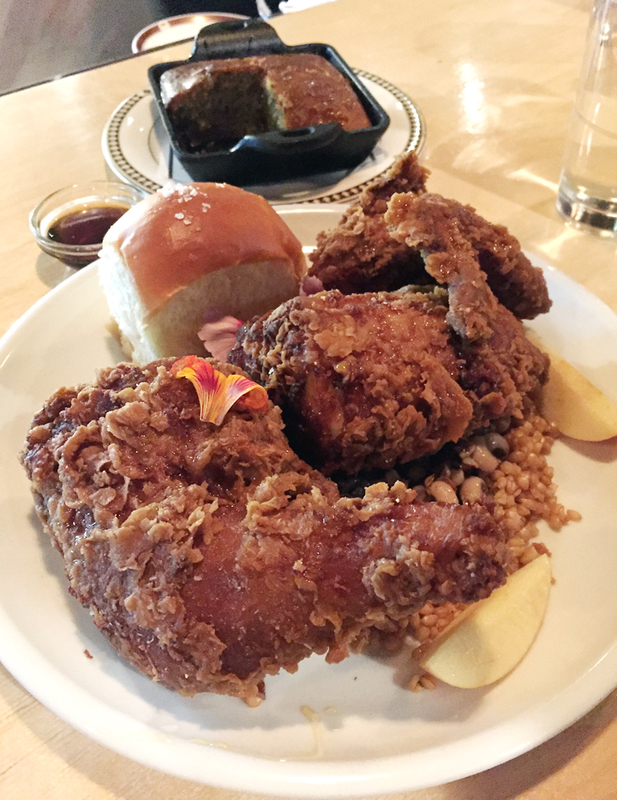 The fried chicken ($25) is half a chicken. Your server will even tell you it’s enough for two people. It is. But of course, not knowing when we’d get another chance to dine here again, my husband and I each got our own entrees. Meat Boy could be dubbed Fried Chicken Boy, too, because he loves the latter so much. The groaning plate was heaped with chicken boasting a sturdy, super crunchy shell that tasted of herbs. The flesh itself was moist and tender, both the dark and white meat. Sometimes after you get past the crust and skin, fried chicken doesn’t always have much taste. Not so here. The meat was seasoned well, like a good Sunday roast chicken that cooks in all its juices. Underneath were black eyed peas, cooked until creamy but still holding their shape, flavored with tangy mustard seeds. A big fluffy dinner roll was perched off to one side, along with a couple of fresh, crisp apple slices, making for a complete meal on one hefty plate. 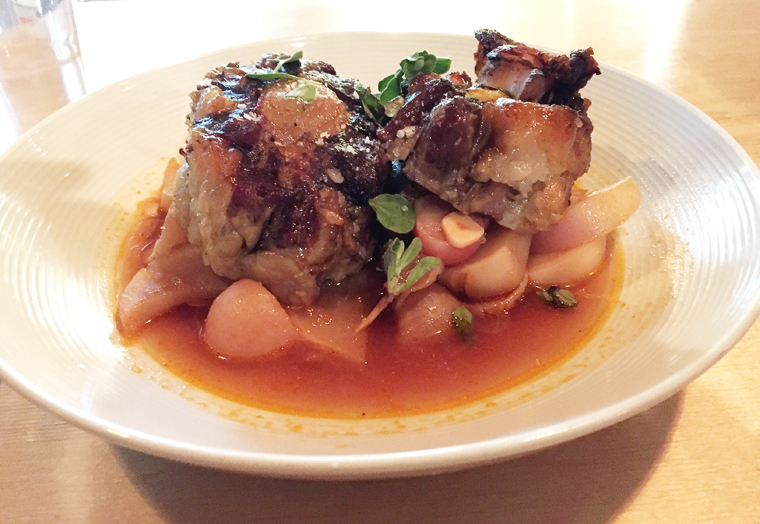 Two very meaty, very tender pieces of oxtail. I went with Momma Jordan’s Oxtails ($21), the meat perfectly tender that could be torn off its big bones easily with just the pull of fork tines. Turnips, which soaked up all the delicious beef jus, garnished this homey dish. 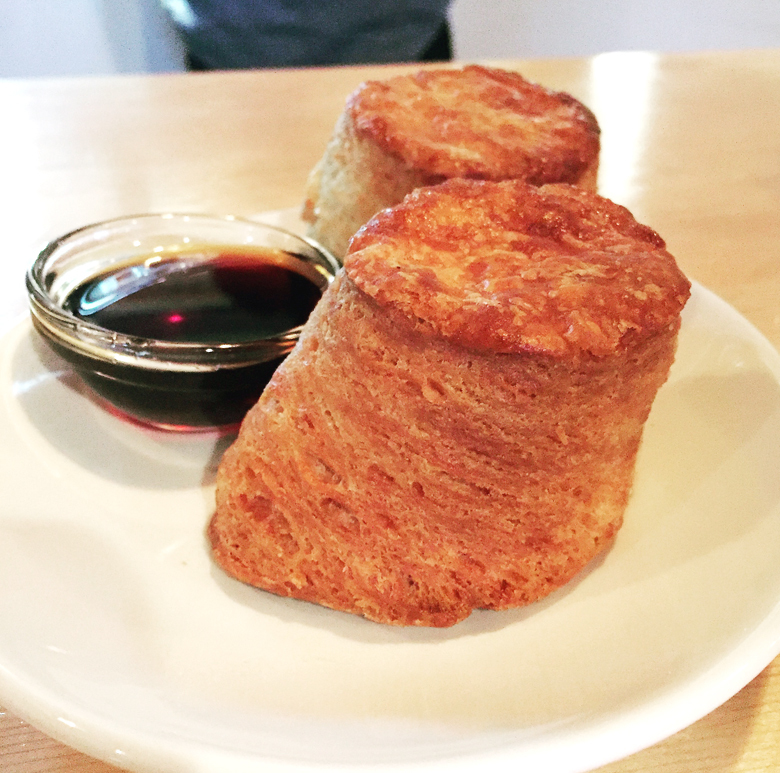 I admit I was tempted to order more biscuits for dessert — if they would let me. 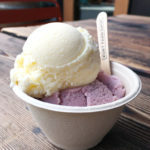 But I actually kind of got that without even asking because the Strawberry-Peach Betty ($9) featured crumbled up biscuit over the top, along with a little lemon curd and a scoop of anise hysop ice cream that tasted subtly licorice-like and minty. 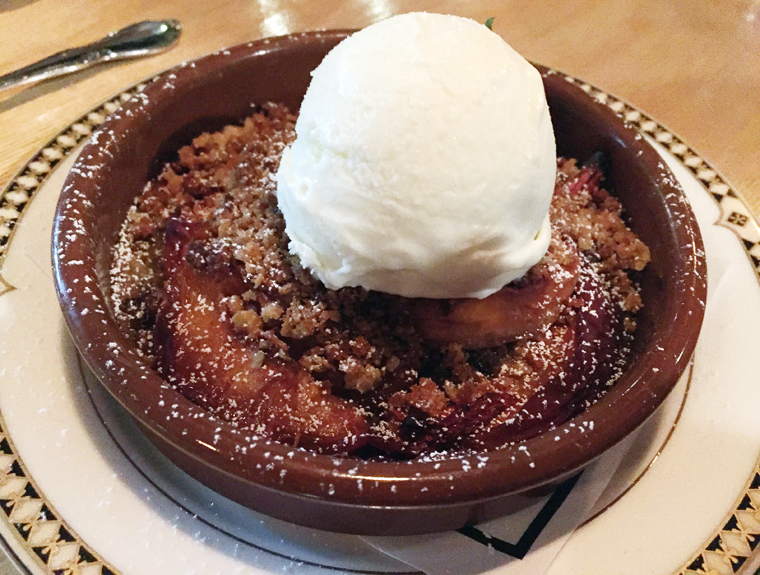 The betty, served warm, was a like a sweet hug — just the kind of down-home dessert you want at a place like this. 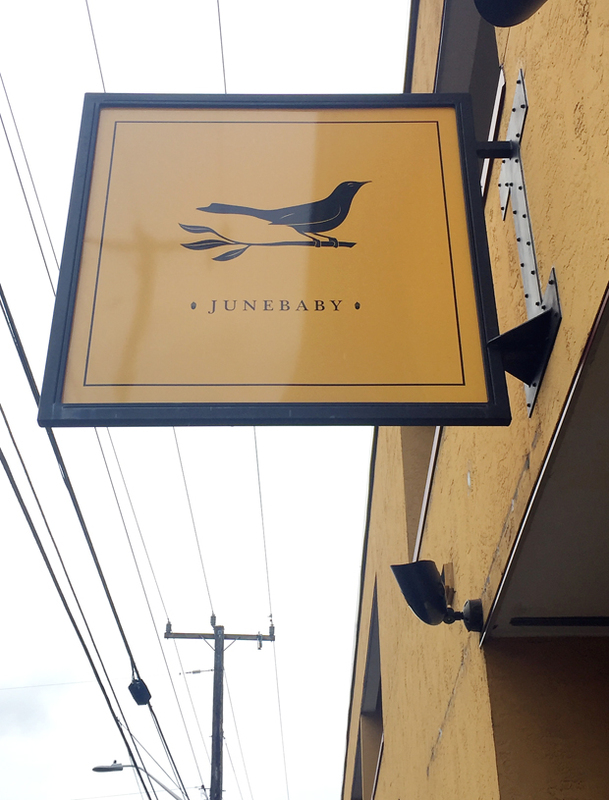 JuneBaby is a taste of the South in the Northwest — one that you gladly hang onto dreamily. Your Via coffeeshop column might have mentioned what styles and strengths of beans are served. We follow the Budweiser Advertising Principle: the weaker the product, the greater emphasis on style (and repetition). It is nearly impossible visiting a different area to know whether the coffee shops serve dishwater or something heartier. Definitely looks and sounds worthy!